I feel that Cowtown RV Park is overpriced for the facilities available. The location is not really good for a comfortable park, but it is close to some stores. Most of the eating places that are close are not really that good, so plan to cook. They are adding on so much that there is going to be very little room for anything but rigs, not really room at the sites for getting out, but if you plan to stay in then it will be fine. They will have new owners soon so I’m not sure how that will go.The new managers do not seem to be very friendly, alot of the help seems helpless, but some are very friendly and helpful. Make sure if you are out walking to watch out for the helpers on the carts some of them will almost run you over as they feel they have the right of way. Dogs are not allowed to run free, which is really of no help as their owners walk them and they go anywhere they please. Such as big poo on your site and no one cleans it up. It seems to complain is of no use because it is the people staying permanent in the park so they are not made to keep their dogs quiet and cleaned up after. Although the speed limit says 7mph those carts fly thru the spaces. I would rate the park a 4, as they do have nice restrooms and laundry facilities. The sites that are padded and the road needs repair and the new gravel sites are very small areas. We stayed a few days in April of ’06. Not a park to stay long term at. But it is ok for a few nights. We stayed at Cowtown on August 4th thru the 7th. We had only planned on staying 1 night, but stayed 3 nights. The people in the office were very friendly. The place was very well maintained and quiet. I enjoyed our drive into town. It was not that far from the Stockyards, which is why we went that way. 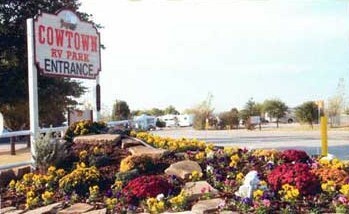 I would recommend Cowtown RV Park. We stayed here in June 2011. The park manager was very nice and helful. The park workers were great, they were always on the job and willing to help anytime. However the park assistant managers were terrible. They were rude to workers and customers and would repremand workers in front of customers. Having been in a management position most of my life it is beyond me how such people could have ever been put into this position. Owners most certainly need to address this situation promptly if they want this park to survive.